I entered Viet Nam with four guys from the Kansas National Guard. Two of them and I were assigned to Charlie Co. We arrived at Camp Evans around June 1, 1969 and became quite close as we were all new, together. 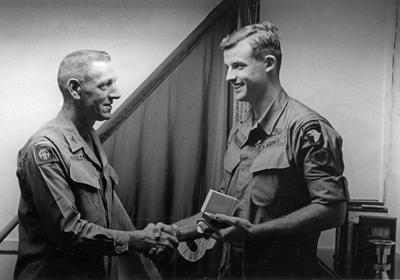 James Bishop, one of the national guardsmen became Lt Kenny’s RTO. On June 23, in late afternoon or early evening, both Kenny and Bishop were shot by a sniper. We had to cut an LZ to medevac Lt. Kenny. Large trees were cut with machetes. 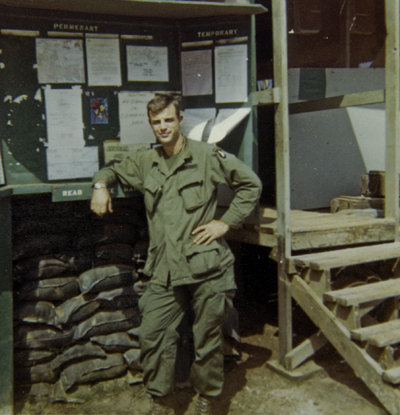 Jim Bishop was killed outright and we carried his body down a trail after dark and joined up with another platoon. I was one that had to be on one corner of the litter carrying Jim. He kept sliding off the litter as terrain was steep. Around July 1 I had a very sore arm and it became swollen. We were on a firebase that was quite hilly, I believe firebase Berchtesgaden. A doctor came to the firebase and anyone with a medical problem could see the doctor. Captain Moore was standing next to the doctor and questioned me why I was there as I did not have an open sore on my body. I told him that my arm hurt. The doctor put his finger on the swelling on my arm, causing me to jump, knocking me and the doctor to the ground. Captain Moore was saying something about an Article 15 because I struck an officer. The doctor told Captain Moore there would be no Article 15 as my action was involuntary and that I would be on the next bird out, with priority over him, because my body was full of infection. I got my belongings and went to Camp Evans. The next morning, the large 4 core abscess broke at the aid station. Medics sent me to the hospital. A doctor there sent me to a “sea hut” barracks off of the field hospital and I lay in 105 degree temperatures with hot packs on my arm. After two weeks, they sent me to the hospital at Cam Ran Bay and I was put in an air conditioned building because of the infection. It was a nice place with hot meals, an air conditioned building, and a movie every night. I was in the hospital about three weeks and then worked on a detail to build an officers’ club on the beach for a week. A colonel came to the hospital and sent all able bodies back to their company. I rejoined first platoon in the field on or about August 15th. 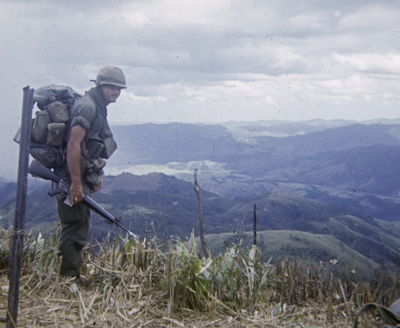 I was told that since I had been resting for a month, that I would be part of a 6-man team to go to the area on the boundary of Laos just departed by the company to observe the NVA. At Firebase Currahee I got on the wrong bird and ended up at Charlie company, my rucksack was sent on an earlier resupply bird. For the next two months I was part of Jim Lee’s squad. We operated in different size units - from company to platoon to squad. We also did some 6-man recon and some 3-man sniper team missions. On the six man teams I carried the extra radio. On the 3-man teams I carried an M14 with a scope. Every time the size of the operating unit got smaller, it was terrifying. On one of the six man team observation operations, we were sure we were put into the wrong location. Jim and I looked at the maps and the ridges running off the nearby hills and we were sure we knew where we were. That night Jim called for some mortar rounds on what he thought was the next ridge to verify our position. It landed right next to him. Then he knew where we were! We moved every day of that mission toward the LZ we thought we were supposed to be observing. One day we were walking on cut bamboo. The point man fell thru and into a dry riverbed that the NVA used as a trail. We saw no enemy. The next morning we came upon music and found GI shelter halves pitched as tents. Jim called in our location and asked if there were friendly units in the area as there was music and tents. The answer from battalion was negative but then the radio erupted with DO NOT SHOOT. It was a lientenant from the company and his squad. They had been calling in false locations. Also during this time I remember being at Camp Carroll filling sandbags for bunkers. I also remember being on rocket ridge just south of the DMZ. We landed on the rock pile late in the afternoon of October 5th. The rocks were razor sharp and even cut the bottom of our boots. The squad I was in was to pull security on the top of the rock. Another squad was sent on patrol. They got ambushed that first night there and the next morning another patrol was sent out to find them. As you said in the story, it rained. They brought am M-60 to me to set on the rock and use as additional fire power. It was raining so all I did was cover it up with plastic to keep it dry. I did not check it out. That next night, our second night there, we saw the light going up the hill and I was ordered to fire on them with the M-60. It was jammed. The following morning I found a round stuck in the chamber. Then I was part of a patrol that went down around the rocks to the opening of the caves. We destroyed many bags of rice by cutting them open and spreading the rice on the wet ground. When back at my post on the rock, which had a hole in the rock that we later found ended up in a cave, we saw movement in the hole and it was an NVA. We finally enticed him to come out of the opening with chocolate candy bars. As you said in the paper it rained all the time there on the rock. Because the rocks were so sharp, I remember we had to sleep standing up because not only did they cut our boots the ripped right through the pants we wore. Some time after this we were on Firebase Victory, tearing it down. In mid December, Charlie company’s Commo Chief deros’d and Captain Moore assigned me that duty. On December 26th I attended the Bob Hope Christmas show in Camp Eagle. Since I was in the rear, First Sergeant Rollins had me go before the battalion soldier-of-the-month board and I was selected to go to the brigade soldier-of-the-month board. I was picked as the 101st 3rd brigade Soldier of the month for January. One of the benefits of this was a rear job. I thought I would be assigned a job. About a week after my selection, the company was in Camp Evans for training. Captain Moore asked me if I had a job. I said no and he gave me 24 hours to find a job or I would be back in the field. I got a job working for the brigade sergeant major until I left country. I helped build an E7-E9 club in the brigade headquarters area. After that was built, I was the bar tender at night. I got that job because I don’t drink alcohol. During the day I was in charge of an E1-E4 club and an E5-E6 club. I stayed in touch with Charlie company because I had to stay on Charlie company rolls as brigade was full strength. I went back every night to get mail and see or hear what first platoon was doing. I remember helping Carroll Turpin get cleaned up when they brought him into Camp Evans after the attack on fire base Granite. 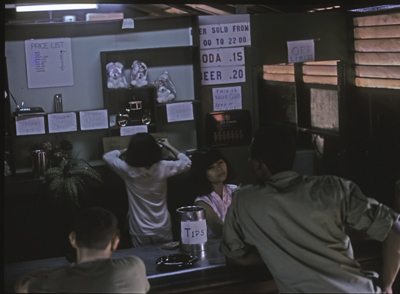 While in Viet Nam, I saw various activities from being in triple canopy jungle hunting NVA, to Commo Chief which was basically getting field requested resupply things ready for the field and then riding the bird to deliver the request. Since I could identify many in the company I could tell the pilot he had the right drop site. I also experienced the more relaxed atmosphere of working at Camp Evans. Dress was also different - it ranged from wet dirty fatigues in the field to spit shined boots and starched fatigues while tending bar. These are some of my recollections and thoughts. Use them as you desire.